Saving your files to the cloud lets you access them from anywhere and makes it easy to share them with family and friends. 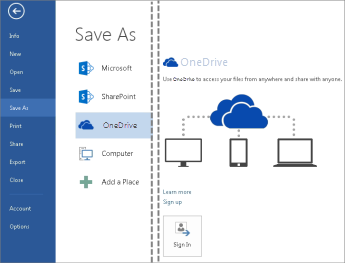 To save documents online with OneDrive, sign in to Office. With a document open in an Office program, click File > Save As > OneDrive. If you haven’t signed in, do that now by clicking Sign In. Or if you haven’t signed up for a Microsoft account, click Sign up. After you sign up or sign in, save your document to OneDrive. Tip: To find your files later, just open the Office app you created the file in and check the Recent list. This works in desktop and mobile versions of the apps. With your files in OneDrive, you can get to them from any computer, tablet, or phone by using the OneDrive website. Just go to OneDrive.com and sign in. For a better experience, download the OneDrive app for your device. Or, use the Office mobile apps. If you use Windows Phone, the apps are already installed. Select your iOS or Android device from the list below to see information that explains how to install and set up the Word, Excel, PowerPoint, or OneNote apps using the account associated with your Office 365 subscription.